Is it really that hard to treat people the way you want to be treated? I’ve had this rule about my baking. You could say it’s an O’Doyle Rule. I don’t give out recipes. I’ll give out food, I’ll make them on request, but I don’t give out the recipe. There is one recipe that I’ve become known for…my Peanut Butter Balls. I’ll admit, its one of the best items I make. They are a crunchy, peanut butter center surrounded by milk chocolate that few people have been able to resist. It’s also my most requested recipe because I only make them during the holidays. I’ve had to rethink the no-recipe-sharing rule. For one, it’s kind of rude not to share. I’m constantly reminding the kids to share their toys yet I’m not willing to share a recipe? That doesn’t make much sense. Second, I’ve discovered that even when I share my recipes, they typically don’t turn out the same way I made it. My office was closing after a buyout by another company so before we parted ways, I shared my Peanut Butter Ball recipe with several friends from work. Sure enough, each of them attempted to make the recipe and not one of them was able to replicate it. So in the spirit of sharing (and knowing that I have a fairly small blog following) I will start posting some of my favorite recipes…starting with my all-time favorite Peanut Butter Balls. Melt butter and mix with peanut butter in a large bowl. Beat well. Add powdered sugar and beat or work with your hands. Add cereal and mix well. Form into balls. Using a double boiler, melt chocolate bar, chocolate chips and paraffin. 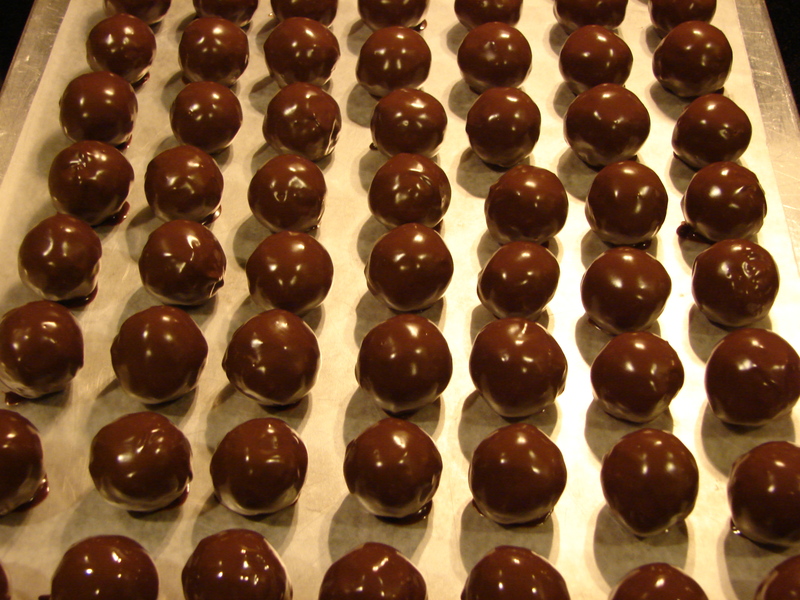 Dip balls into chocolate and place on waxed paper. Refrigerate until set. Personally, I enjoy keeping them chilled before eating. However, if you like a softer consistency they can be enjoyed at room temperature. If you get a chance to try these tasty treats, please let me know how they turn out for you. Enjoy! WARNING — there is NOTHING low-fat or healthy about these! The Evil Mr. O’Doyle made these while I have been dieting. Evil evil man! I should add that the reason they are evil is that I cannot resist them! I have the same issue about sharing a recipe. I want to be friendly and spread the good eating around, but once the recipe is ‘out’ there is a chance someone else will bring it to the same function. I go to two or three group activities (church, pot lucks, etc.) and when I share a recipe suddenly I can’t take the fabulous chocolate cake because Betty Sue might bring it. I guess there are worse problems then having two chocolate cakes at an event. As I’ve given it more thought, I have finally come to the conclusion that the reason I haven’t shared my recipes is really due to my own insecurities. I’m afraid that someone else will make it better. If I were truly confident in my own abilities I never would have hesitated to share my recipes (and even the tricks and tips I use) to help others.